For today’s lunch, I thought I would try this recipe I found in America’s Test Kitchen, “Cooking Fresh,” 2015. It was so colorful and fresh-looking that it had to taste good. Well, my daughter and I were not disappointed! 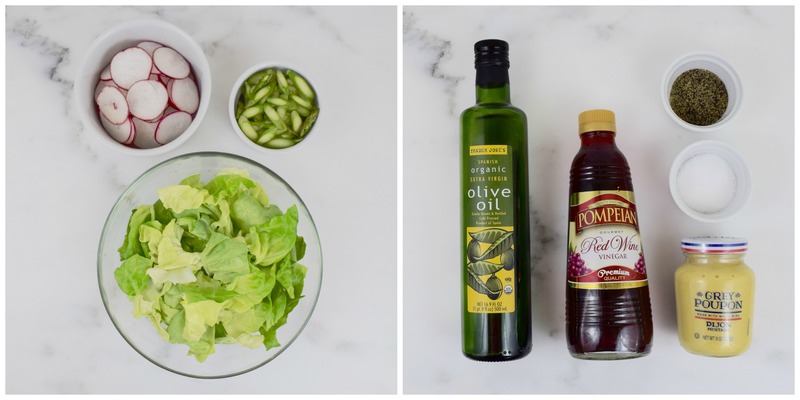 We loved the simple vinaigrette dressing, using red wine vinegar and seasoned with minced garlic, salt and pepper. The only thing I would do differently is I would add some protein in the form of lean meat or legumes to make it a more complete meal. As usual, I made slight changes to the original recipe to suit my taste and cooking style. It is a wonderful salad using common ingredients found in the refrigerator during the summer! Whisk together vinegar, garlic, ¼ teaspoon salt and ⅛ teaspoon ground pepper in a large bowl. Drizzle in oil, while constantly whisking. Add bell pepper, onion, radishes, parsley, cucumbers and tomatoes and toss to coat. Let sit for 5 minutes. Finally, add lettuce and serve immediately. 4 servings. 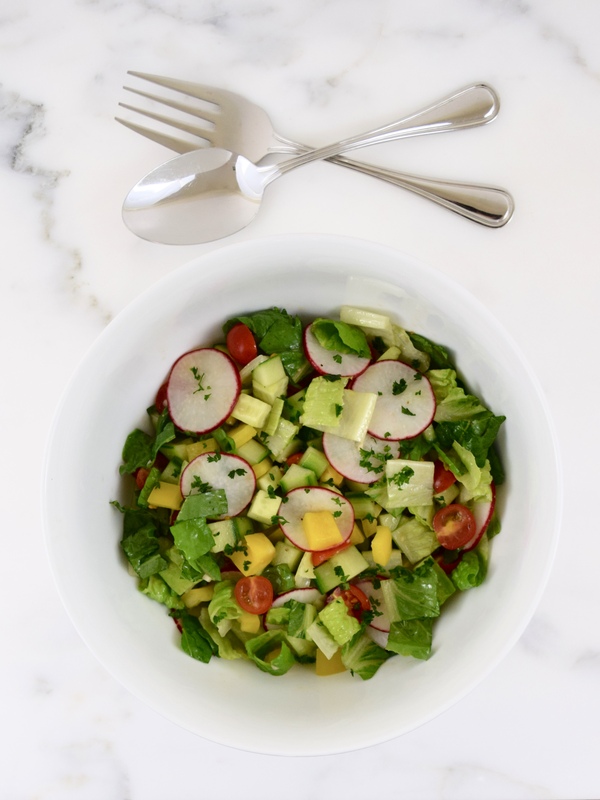 As the temperature nears 106 degrees, a cold, crisp and tangy salad is in order. When I saw the pretty and colorful picture of this dish on Pinterest earlier this week, it made me want to look further into the recipe. Since I already had all the ingredients to make this slaw, I thought I would make it as a part of today’s lunch. Within minutes this simple and healthy dish was ready to consume! 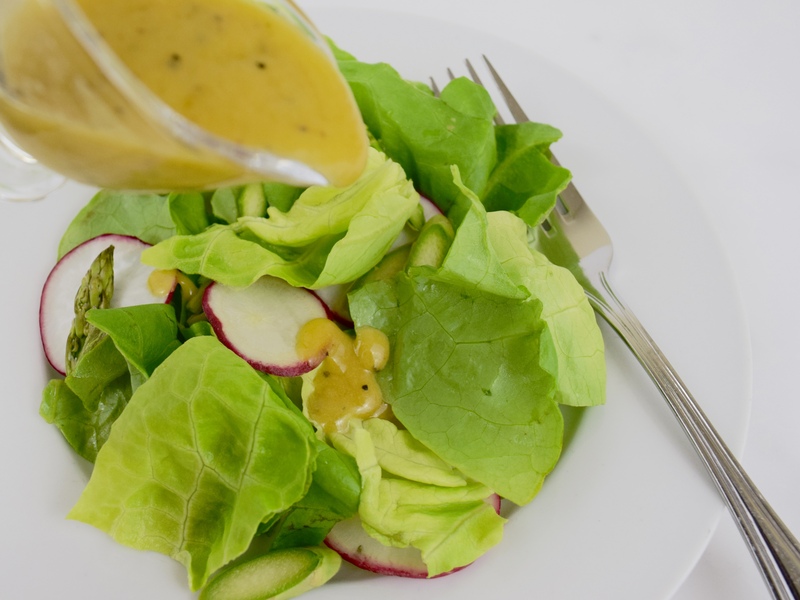 It tastes great after being chilled and allowing the vegetables to marinate in the dressing for an hour. This delicious recipe was “pinned” from Better Homes and Garden website. In a large bowl, whisk together the vinegar, oil, sugar, salt and pepper. 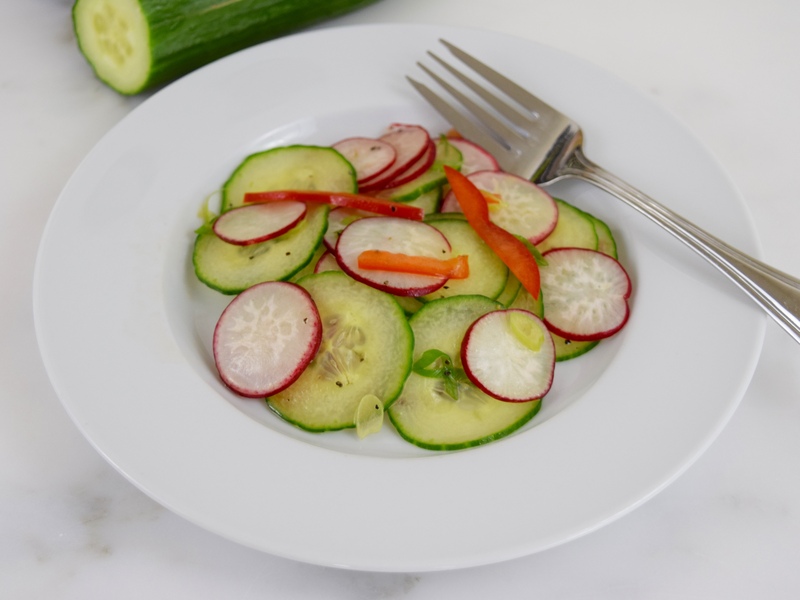 Add the cucumber, radishes, bell pepper and green onion and gently toss. Serve immediately and chill up to 2 hours. 6 to 8 servings. 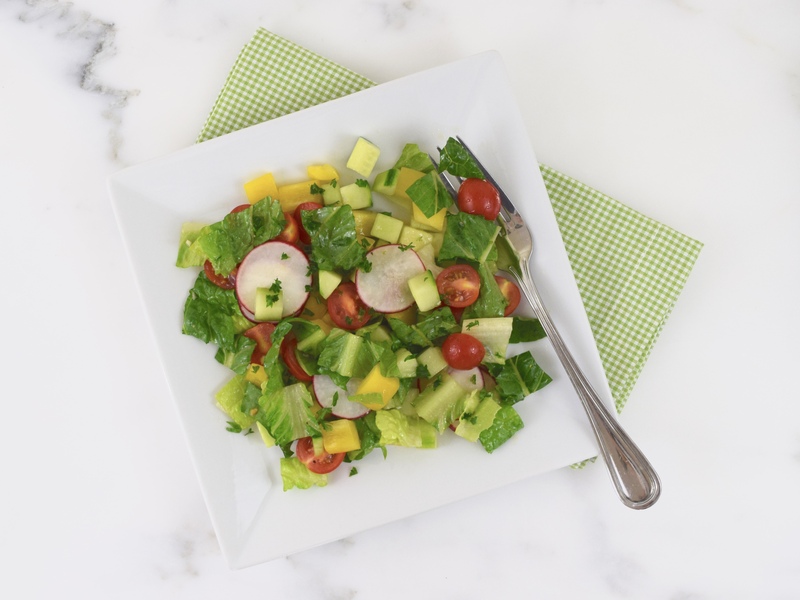 This is a quick and simple salad to prepare during the busy work week. There is a total of only eight ingredients, including the salt and pepper! 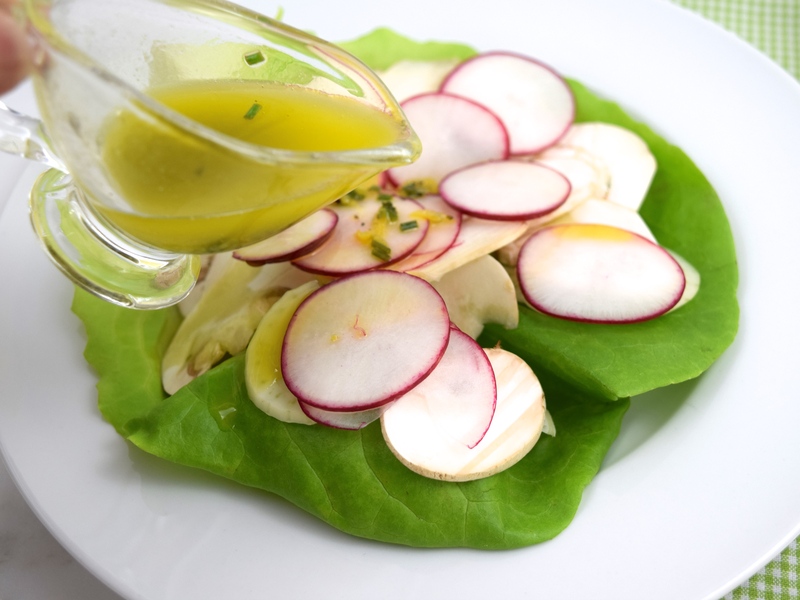 You can even slice the radishes and asparagus and make the salad dressing in advance. It can’t get any easier and delicious than this. 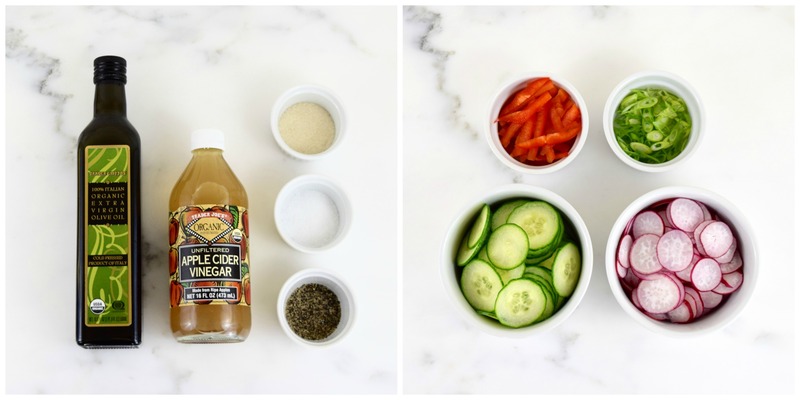 This recipe was so simple and healthy that I couldn’t even make any changes to it! It came from Martha Stewart, Everyday Food, published April 2010. 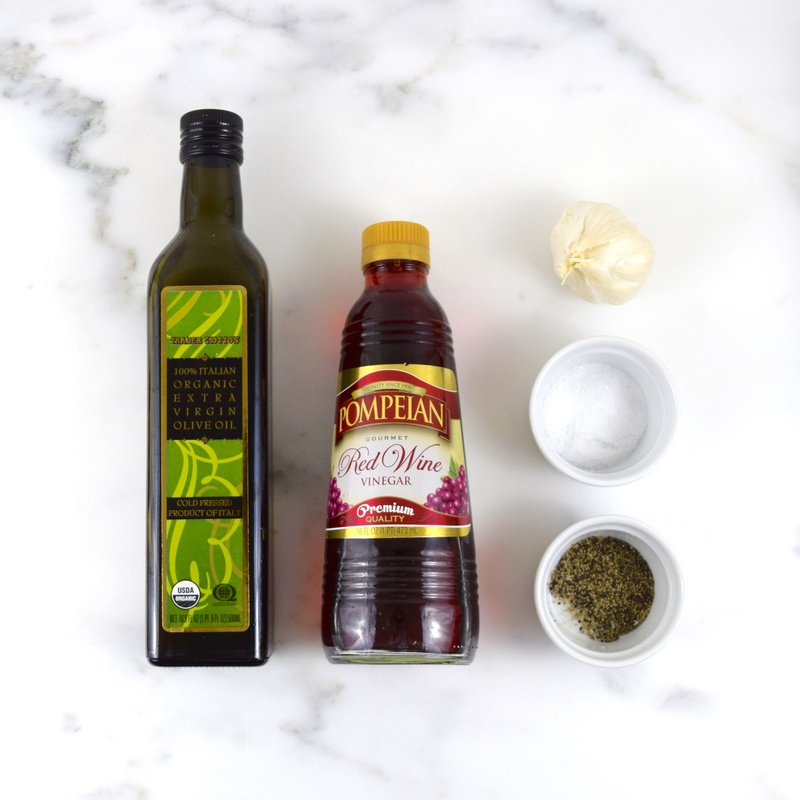 Using a medium-large bowl, whisk together the mustard, vinegar and olive oil. Add salt and pepper to taste. 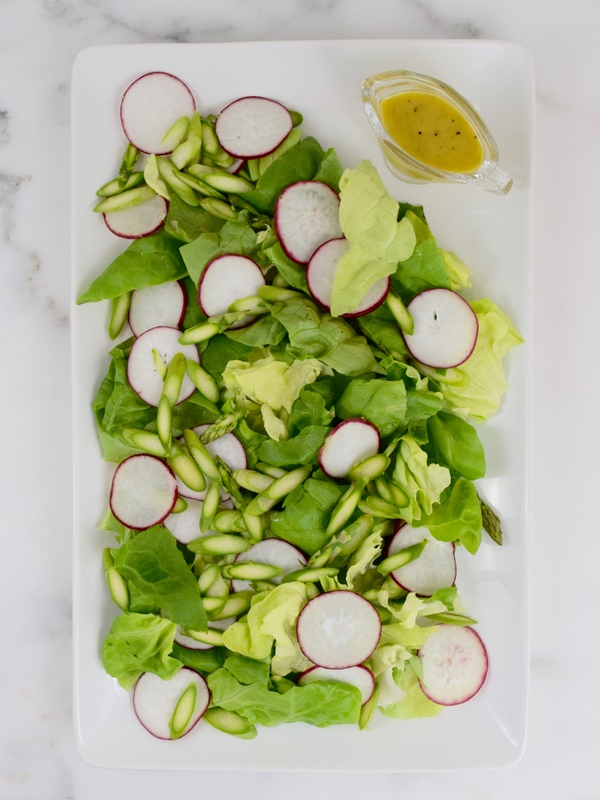 Then mix in lettuce, radishes and asparagus. Toss together and serve immediately. Serves 4. 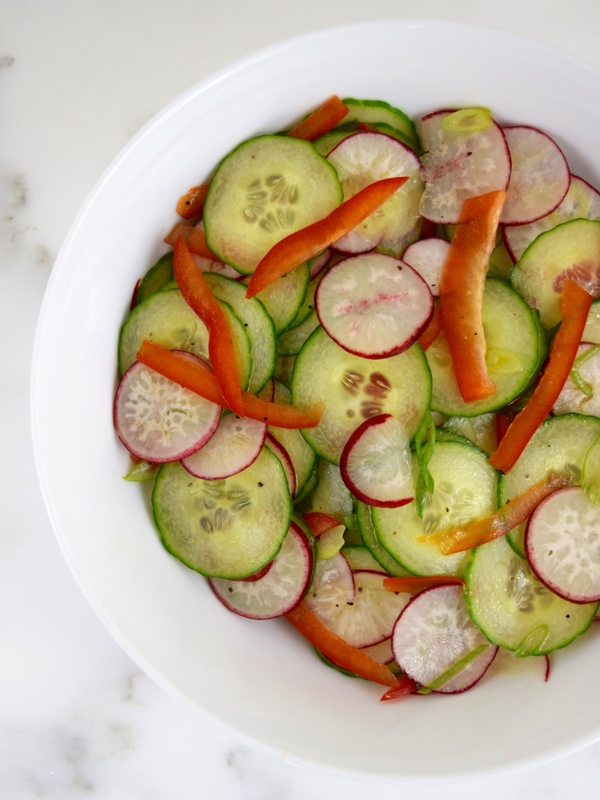 When I saw this delicious and colorful salad being made by Giada De Laurentiis, I decided right then and there that I needed to buy myself a mandoline! 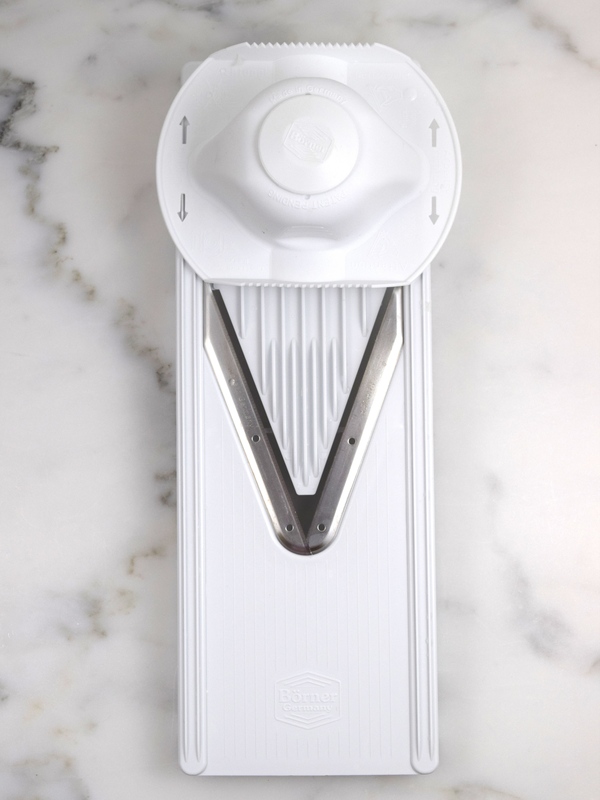 So I searched the internet, watched videos and made the decision to purchase on Amazon the Börner V-Slicer Plus Mandoline. The mandoline was pretty easy to use once I figured it out, but be very careful not to cut yourself! 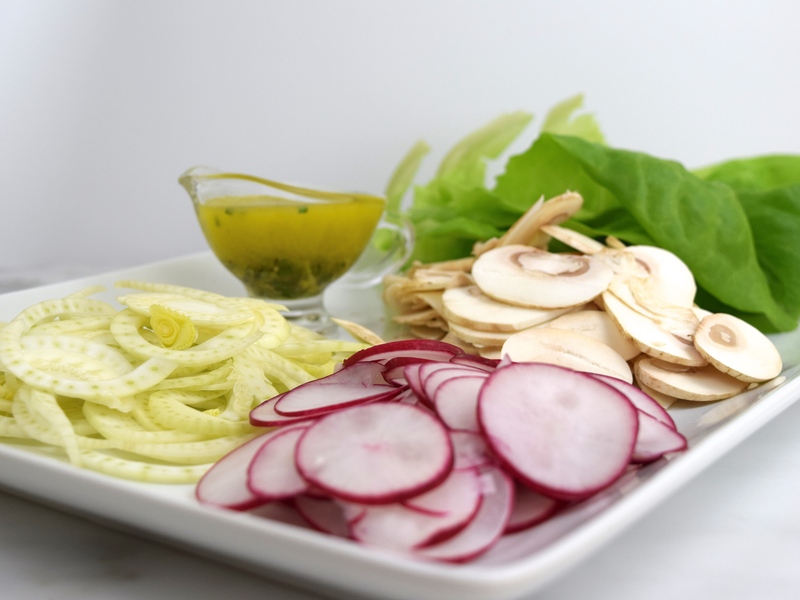 Place whole lettuce leaves on a large platter, along with the thinly sliced mushrooms, radishes and fennel. Whisk together the oil, lemon juice, chives, lemon zest, salt and pepper in a small bowl to blend. 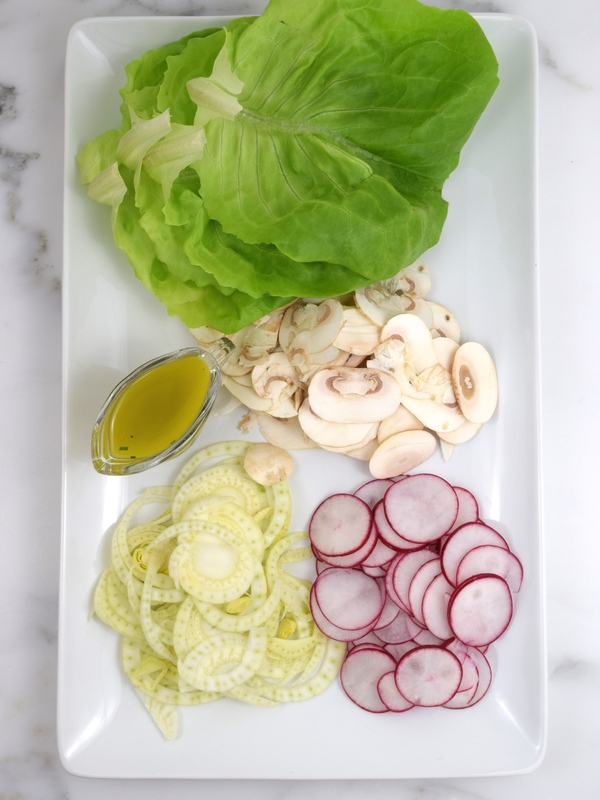 Using 4 individual plates, place some sliced fennel, mushrooms and radishes on top of a Bibb lettuce leaf. Add dressing and enjoy! The salad was light and refreshing! It is a delightful mixture of flavors and textures. 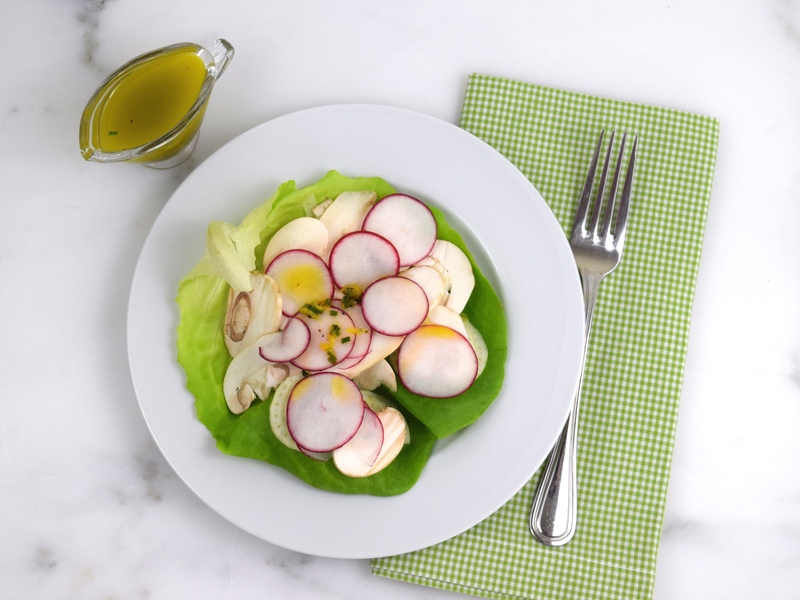 You have the licorice taste of the fennel, the spicy radish, the buttery flavor of the Bibb lettuce with the lemony-chive vinaigrette! I used half the amount of salt and pepper and only 4 tablespoons olive oil, but used more lemon juice, approximately 3 tablespoons in total. 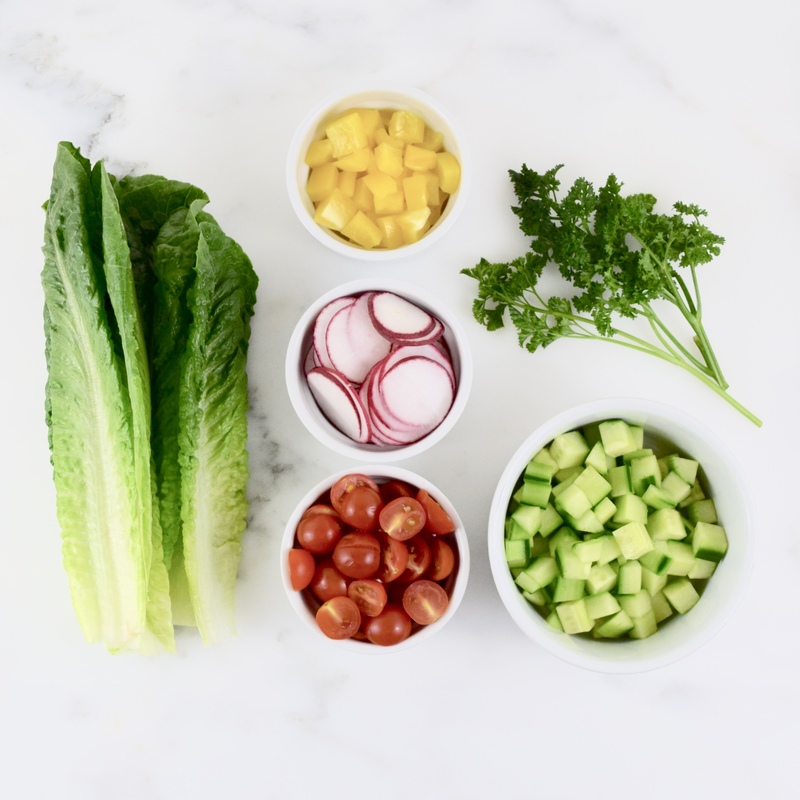 This salad is not only simple and delicious, but so healthy to eat!